The athletic apparel, footwear, and technology maker beat profit expectations last quarter, announced more optimistic guidance for the rest of the year, and delivered a big boost in operating income. What a difference a year makes. Shares of Under Armour Inc. (NYSE:UA)(NYSE:UAA) are still down by more than half from their all-time highs reached more than three years ago, but they've gained more than 81% since bottoming out on October 31 of last year, when the company announced a major restructuring effort that would cost hundreds of millions of dollars and take more than one year to complete. Fast-forward to the third-quarter 2018 earnings release, and there are signs that the company is starting to turn the page; at least Mr. Market thinks so, having sent the company's stock surging almost 28% after the earnings call. Whether the results "deserved" such a big jump may be debatable. Under Armour's sales were up only 2.4%, and it generated only $75 million in net income. But both figures were well ahead of Wall Street's expectations -- a major reason for yesterday's big price gain -- and they also exceeded the company's own guidance. Let's take a closer look at what's happened with the erstwhile high-growth apparel and footwear maker that's trying to get its mojo back. How much progress has it made? Under Armour reported sales of $1.44 billion and earnings per share of $0.17 per share, up 2.4% and 41% year over year, respectively. Once again, the biggest drag on the company's results was its North America segment, which reported a 1.6% drop in sales to $1.06 billion. The international business continues to do relatively well, reporting 15% or higher sales growth in each segment in what management said would be its slowest-growth quarter for international sales. Connected Fitness generated over $31 million in sales, up 20%. The company is starting to see some benefit from its restructuring efforts. Operating income was $119 million on a GAAP basis, up 91%, while adjusted operating income was $143 million. Gross margin increased a modest 10 basis points to 46.1%, while adjusted gross margin of 46.5% was up 20 basis points year over year. SG&A -- sales, general, & administrative expense was up 5%, primarily related to increased investments in growing the direct-to-consumer business, international sales, and growing the footwear business. On the earnings call, CFO David Bergman said, "Relative to our expectations, we are realizing some early benefits from our efforts to drive greater efficiency and effectiveness." Overall, Under Armour's improvements are modest but still a very solid step back toward profitability and positive cash generation. Over the past several years, Under Armour added a substantial amount of debt. It surpassed $1 billion about one year ago, but since then, it has paid it down by about one-fourth. The company ended the quarter with $803.5 million in long-term and short-term debt, up from $779.4 million at the start of the quarter, so it has increased a little in the near term. At the same time, Under Armour's cash position declined by $28 million, shrinking to $169 million. I can hear you asking: Where is the balance sheet improvement? A balance sheet is made up of far more than just cash and debt, including other assets like pre-paid expenses, accounts receivable, and inventory, and liabilities like accounts payable and accrued expenses. UAA Total Long Term Debt (Quarterly) data by YCharts. Under Armour's working capital -- current assets minus current liabilities -- improved by $64 million in the quarter, as it added more than $140 million to accounts receivable and reported a nearly $200 million reduction in accounts payable, along with other offsetting changes. 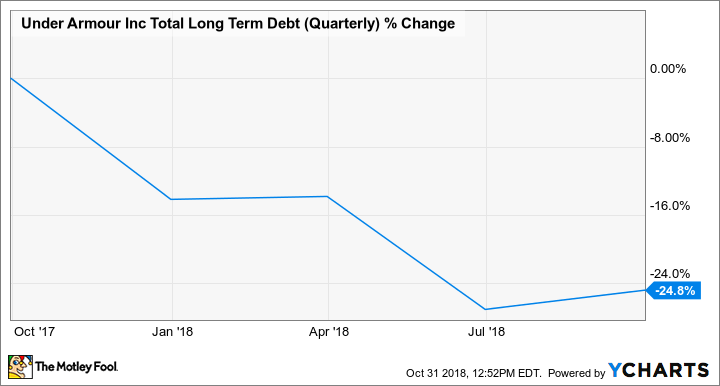 These working capital changes more than offset the slight increase in debt, resulting in the company adding about $82 million in equity to the balance sheet since the end of the second quarter. The big key here is that, heading into one of its most important quarters at the end of the calendar year, the company has made considerable effort to chip away at its debt, which will result in more cash flows it can put to better use. Unlike last quarter, when the company caught investors off guard with a big increase in how much it would cost to restructure the company, Under Armour held firm on its expectations to spend $200 million to $220 million this year on a pre-tax basis. It also held firm on expectations for full-year sales, which it expects to increase 3% to 4%, with international segments growing 25%, and its guidance for gross margin, which it expects will fall slightly from last year's 45%. However, due to a one-time tax benefit from an inter-company asset sale, Under Armour's full-year tax rate is expected to fall substantially to 13% to 15%, versus the original expectation of 25% to 27%, which will add about $0.02 per share to the full-year bottom line. The company now expects to generate $0.19 to $0.22 per share in adjusted earnings for the year. While Under Armour's earnings and operating results are still far below the levels it was generating only a couple of years ago, the bottom-line results were substantially improved, swinging from a $108 million operating loss in the second quarter to $119 million in operating income this quarter. Based on its full-year guidance for a $50 million to $55 million operating loss for the full year, the company is likely to revert to an operating loss in the fourth quarter, but this looks to be primarily due to substantial planned costs related to its restructuring, which could reach as much as $66 million in the quarter. The real measure of the company's progress is likely to be in 2019 as it moves past the restructuring phase and demonstrates -- or not -- whether the actions it has taken will return it to accelerated, profitable growth.